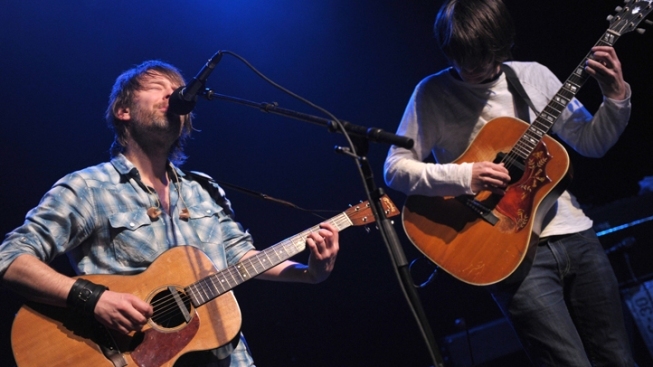 Thom Yorke and Johnny Greenwood of Radiohead. The influential UK band Radiohead has ventured into censored Chinese cyberspace. The AP reports the band posted a message on the equivalent there to Twitter, through the widely used portal Sina.com. The message read only "testing the weibo" ('weibo' roughly translates to microblog in Chinese). But who knows what this portends, as Radiohead has been highly outspoken against Chinese governmental policies, playing 'Free Tibet' concerts. In December, the band posted a note on its webpage pressing for the release of Chinese human rights activist Liu Xiaobo. A web-savvy group of gents, Radiohead has previously streamed live concerts and changed album marketing models with the self-release of In Rainbows through its website. Known for actively expressing free speech through the web, dissension from Chinese policy would be expressly forbidden on any such website, as Sina has as many as 100 employees censoring web feeds 24 hours a day.